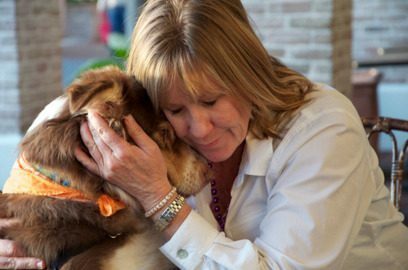 Nancy Bown of Sandestin, Florida, a graduate of the Animal Behavior College in Santa Clarita, Calif., and a Certified Professional Dog Trainer – Knowledge Assessed (CPDT-KA). She is a “fear-free” trainer. While operating her dog daycare and dog training business, she saw how many dogs were being relinquished or returned to shelters because the owners and dogs weren’t given the proper education and training to build forever lives together. She also noted that otherwise good dogs were being turned in to shelters because children did not know how to interact with dogs, such as running up to strange dogs to pet them, or pestering and grabbing grandma’s Chihuahua while it was eating, resulting in bites. So she created Dog-Harmony Inc., a nonprofit that works to keep dogs from becoming homeless in the first place. While it offers the typical links to low-cost spay/neuter surgeries and microchipping clinics, the volunteer-run organization is a different “breed” of rescue, focusing on humane education and training, an unfulfilled need to keep dogs in their homes. Bown pulls dogs from kill shelters and rescues, trains them and matches them with compatible families. For example, a high-energy dog won’t be placed with a couch potato, or a Great Dane won’t go to someone living in a studio apartment. Adopters then are given training and support before, during and after the adoption to ensure it goes smoothly. It’s a time-consuming process, but worth it to keep animals from being regurgitated through the shelter system. About 6 percent of dogs adopted from shelters are returned, according to the ASPCA. At that percentage, Dog-Harmony, which has adopted out 183 dogs since 2013, would have had at least 10 returned. Instead, only two have come back. In addition, Dog-Harmony offers programs for children and the public at large. For children, there are fun classes for responsible pet care and bite prevention, and each child goes home with a free coloring book about how to stay safe around dogs. Dog-Harmony also will be offering “Kids and Canines” spring break camp, which will add how to bake dog treats and make dog toys out of recyclable materials. For adults, there are low-cost dog training clinics, plus free responsible pet ownership lectures.